Most of the time, my pile of quilt fabrics works like the paint for an easel artist. I see the fabrics as colors or textures that will work (or not) in the quilt I am making. In 2011, some of the fabrics were more compelling as themselves. Using a printed fabric as itself is known as ‘per se’ applique. In speech, ‘per se’ means for oneself, or as oneself, and it works exactly the same way with fabrics. 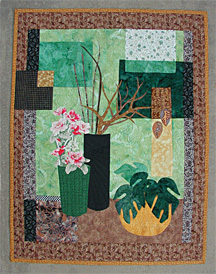 Still Life Per Se 41" x 31.5"
‘Still Life Per Se’ features flowers and leaves from prints. The simple shapes create elements of a still life painting. I was looking for a balance of curves and straight lines. The large philodendron leaves add a larger scale to the abstract brown leaves and the pink flowers. The quilt became a fine canvas for lots of free-hand machine quilting. Sometimes I find the quilting design in the fabric, as in the two abstract leaves. Panamanian Molas 28" x 39"
My husband brought these home from Panama years ago. Every little applique has a delightful character, and they were anxious to escape from the storage box. My goal was to create a background quilt with a little jungle and a little heat to put the embroideries in context. This is the second quilt I made with the molas folk art. A friend’s mother had given him two different embroideries sized for throw pillows. One was quite worn, and a few pieces needed to be replaced. I worked for quite a while to create a wall quilt with both embroideries. I’m sure there are lots more of these embroideries in circulation. They seem to be a mainstay of the tourist trade, and yet each one is expertly crafted with care and joy. These two quilts will be in the ‘Fabric Treasures’ show at the Tri-Lakes Center for the Arts in Palmer Lake October 15- November at Hwy 105 just south of County Line Rd. The opening is October 15th, 10 a.m. – 4 p.m. There are also sewing demonstrations on other weekends — call TLCA for details.